Many thanks to two NELSAP readers who told us about this lost area in Rumney! It was a private rope tow area that was operated by the Rumney Bible Conference in Rumney, NH. It was used mainly for church groups. The rope tow was about 850' long with a vertical drop of 150'. Winter campers now use surrounding areas like Waterville, Tenney, Loon, etc. Keith McKenney: There is another lost area in central NH. The Rumney Bible Conference located in Rumney NH (west of Plymouth ). It had a rope tow and I recall a single slope. I work at the RBC during the summer of 74 and remember the hill located behind the cabin that housed me and the other cook and maintenance helpers. My older sister said she first skied there on a winter retreat several years earlier. The center still holds retreats for teens but I believe the hill is now used for tubing. John Lennerton...it was a private area in Rumney, NH (just west of Plymouth) off of Rt. 25. It belongs(ed) to the New England Fellowship of Evangelicals, and every winter they would have weekend "snow camps" for church groups, etc. They offered skiing, tubing, snowmobile rides, snowshoeing, well, you get the idea. The slopes were on a ridge at the back of property, one for skiing with a rope tow powered by an ancient 6 cylinder ford engine, another slope for tubing. 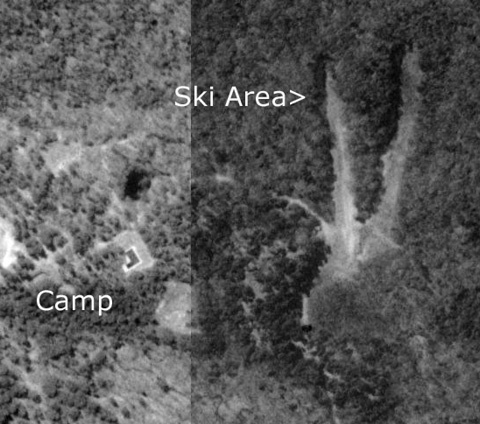 The slopes were small, but this is where, as a staffer, I learned to ski, sort of. I never became a great skier, but it was a fun slope. I'll bet somebody who went there with their church teen group remembers the place.